Dasmarinas HOUSE and LOT and LOT ONLY for Sale. Location: Along Governors Drive Dasmarinas Cavite. Accessible Points: 15 mins. from SLEX Carmona Exit, 5 mins. from SM PalaPala Dasmarinas. 10 mins. to Bacoor via Paliparan, 25 mins. to Tagaytay City. Landmarks: SM City Palapala Dasmarinas, Wilcon Depot Paliparan. Greenwoods Paliparan Dasma. Sales & Mktg: Praise Realty Mktg. Corp. Active Zone : Hilltop Gazebo Futsal Lawn Pavilion, Basketball court, Seating mounds, Childrens playground , Palarong Pinoy Courts. Social Zone : Clubhouse Function Room for 25 and 50 pax Multi purpose area for 150 pax, Kiddie Pool Kitchenette Chillax Pool, Male and Female lockers , Pool Deck Property Management Office Provision for Community Store. Relax Zone : Chapel .Romantic Gardens, Picnic Grove, Dog Park, Kite Flying Lawn, Linear Park with Community Farming , Interactive Fitness, Route & Bike Trail. The Advantage Townhouse - with 2 Bedrooms, 2 Toilet & Bath, Living, Dining, Kitchen, Carport & Service Area. The Executive Townhouse- with 3 Bedrooms, 2 Toilet & Bath, Living, Dining, Kitchen, Carport & Service Area. The Premium Single Attached- 3Bedrooms, 3Toilet & Bath, Living, Dining, Kitchen, Carport & Service Area. The Prestige Single Attached- 4Bedrooms, 3Toilet & Bath, Living, Dining, Kitchen, 2 Carport & Service Area. The Elegance Single Detached- 4Bedrooms, 3Toilet & Bath, Maidsroom w/Toilet & Bath, Living, Dining, Kitchen, 2 Car Garage & Service Area. 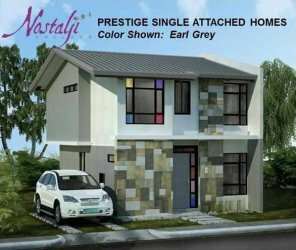 The EliteSingle Detached- 4Bedrooms, 3Toilet & Bath, Powder room, Maid'sroom w/ Toilet & Bath, Living, Dining, Kitchen, 2 Car Garage & Service Area.